Summary: Identity theft is becoming increasingly common, and identity theft protection is one of the best ways to keep yourself protected. Whether its credit card fraud, social security identity theft, or exposure through a phishing email, we’ve found the top companies who can keep you safe with their identity theft protection services. The main identity theft definition is any time that a criminal uses your information to pretend to be you. This might be to commit a financial crime, such as using your credit card to make unlawful purchases, or it could be to claim something like your tax refunds and various benefits. In some cases, your identity might be used to shield the real identity of someone who is committing a crime, such as illegal access to the country or even participation in money laundering or drug procurement. If you are ever the victim of identity theft, you may require legal assistance to make sure any fraudulent records are cleared and that your identity is properly restored. ID Watchdog offers a comprehensive Identity Restoration service for as little as $14.95 a month. Please see ID Watchdog review for more information. The best identity theft services can identify scammers looking to use your identity long before they get the chance to do any harm. This is because there are common ways which criminals gain your information, and with the right know-how, you can be protected. Let’s quickly go over some of the biggest forms of identity theft. 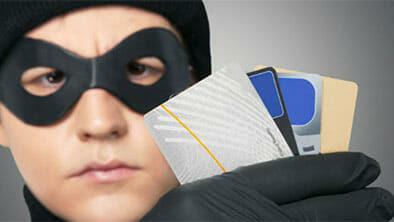 One obvious way that credit card fraud occurs is when you lose your card or it gets stolen. But even without this, identity theft can still happen. Criminals can use a ‘skimming machine’ which takes only seconds to remove your credit card details and store them internally. This can be done anywhere you use your card, including by criminals posing as waitresses or shop assistants. Unmanned credit card readers, such as ‘pay at pump’ at gas stations have led to an increase in identity theft. This is because devices similar to skimming machines can be placed on top, waiting for unsuspecting users to enter their card. Malware can also be put onto low security retail websites, so that when you make a purchase, your credit card information is instantly sent to the criminals responsible. Credit card fraud is rampant. The Nilson Report estimates that in 2016, losses due to fraud were over $24.71 billion. ACI Worldwide (an electronic payment systems company) estimated that 46% of Americans have been victims of credit card fraud at some point over the past five years. The Bureau of Justice Statistics determined that $2,895 was the average total out-of-pocket loss for credit card fraud victims in 2014. And it’s staggering just how often mass credit card fraud occurs – take 2014’s Home Depot breach of 56 million credit cards, or in the same year, Target’s data breach – affecting up to an eye-watering 70 million customers. These stats demonstrate just how severe a threat it is, so to ensure your online safety it’s imperative to subscribe to an online monitoring system. As well as only shopping online from reputable and secure websites, credit card fraud can be avoided by monitoring your bank accounts. IDShield offers the best credit card monitoring protection, which includes retail and store cards as well as credit cards. They have regular credit monitoring, as well as tracking your credit scores. Best of all, it’s just $9.95 for a subscription. Get more information on IDShield review. Your Social Security Number is what every criminal is hoping to find, the holy grail of identity theft. If an identity thief manages to get hold of this number, they don’t need much else to open bank accounts, take out loans, or even access your existing accounts. They could even get a job in your name, and medical insurance too. The reason why a social security number breach is so dangerous is that your social security number is yours for life, it can’t be closed or ended like a bank account or a credit card term. If you do have a social security breach, you’re going to hope you have identity theft protection with the best insurance and rehabilitation options available. For just $19.99 per month, PrivacyGuard is the best for fixing the problems which ID theft can cause, including repairing your credit rating, dealing with the police, and recovering lost funds. They even give you your own caseworker to help navigate this complicated journey. More information can be found on PrivacyGuard review. Believe it or not, the most common way for an identity thief to get your information is you handing it over to them without even realizing it. Some criminals are experts at hiding who they are when they get in touch with you by email or online links, encouraging you to offer up your passwords or PIN numbers. They could be hiding in an email from the bank, or a special offer. And because it looks like a usual email from them, you never suspect anything unsavory. The golden rule is to never ever give out your passwords or PIN numbers to anyone, no matter what. IdentityForce is $13 per month plus $3 per child to get total family protection, so that you don’t have to worry about the rest of your household either. More information can be found on our IdentityForce review. These three examples are the most common ways that thieves will steal your information to commit identity theft. Here are some ideas to keep yourself protected. Request to pay your bill at the table in a restaurant or in front of you in a store. Don’t let the shop assistants take your credit cards out of view. Only shop online at reputable stores who offer strong security encryption, and consider using a service like PayPal to pay for purchases. Be wary of giving out your social security number, and always ask if something else will suffice, for example a phone number or another identifier. Never give out sensitive information such as passwords or PINs when they are requested by email or on websites. Make sure to choose strong passwords and never use the same password for all websites. Leave unneeded items carrying sensitive information – such as your checkbook – at home. Encrypt your Wi-Fi connection to prevent hacking. Cancel all unused credit cards and bank accounts. Contact your bank immediately if any mail containing sensitive information doesn’t arrive on time.